will unite. Abhi says they are getting late. Dasi says they will come. Purab asks him to come. Pragya asks Nikhil not to come inbetween them and says she will not let Tanu marry him. She says Tanu was pregnant with your baby and was giving name to baby of Abhi. She says Tanu is using this. Nikhil says Tanu is marrying Abhi with my wish and says I am letting her marry him. Pragya tries to emotional blackmail him and says you must have feelings for him. She asks him to do one good thing and says your sins will be washed. Nikhil sees Abhi far and takes Pragya to room. Abhi is sad. Pragya’s hand kerchief falls there. He takes her inside. Aaliya comes and stops Abhi from going to room. She asks him to come. Nikhil keeps hand on Pragya’s mouth. Aaliya asks what he was talking to Dadi. Abhi says nothing and says it was about marriage. Aaliya says you would have asked Pandit ji and asks him to come. Pragya tries to push him. Abhi thinks he feels as if Pragya is here. Pragya tries to kick on the door to make noise. Nikhil closes the door. Aaliya asks what happened? Abhi says something had fallen. He sees Pragya’s handkerchief there and picks it up. He gets emotional. Pragya asks God to send someone and not to separate her from Abhi. Aaliya asks what happened? Abhi keeps handkerchief in his sherwani and asks Aaliya to come. Dasi tells that Abhi went down. Dadi says marriage will happen now. Purab says Aaliya took Abhi holding his hand. Purab says Aaliya will get them married today. Dadi says this is God’s justice. They celebrate without thinking about Pragya. Nikhil tells Pragya that everything is finished now and tells that all her talks are nonsense, and says if God wanted then Abhi would have been here.. Pragya pushes him and tries to hit him with showpiece. He falls. Pragya is about to go. He pulls the floor mat and makes her fall down. He holds her and pushes her. She picks a vase and is about to hit him. He holds her hand and hits vase on her head making her unconscious. Pragya faints and falls down. Mrs. Mehta waits for Abhi and Tanu. Mitali says what is going on and tells Tai ji that Abhi will not return. Abhi comes back with Aaliya and sits on the mandap. Aaliya says she will bring the bride now and asks Tanu’s mum to make sure that Abhi sits here. She agrees. Nikhil looks at unconscious Pragya and thinks to check outside. He throws her dupatta and peeps outside the room, sees Dadi, Dasi and Purab. Purab sees someone standing behind the door. Dadi tells that everyone is in the hall. They take Purab. Nikhil thinks to send Pragya to some place from where she couldn’t return atleast today. He calls Damru and asks him to reach upstairs. Damru says okay. He hears someone coming. Aaliya thinks where is Tanu? Nikhil calls her and asks her to come. He takes her inside the room. Nikhil says I want to tell the plan. Aaliya says I am going to go and tells that she will kick him out after marriage. He asks him to listen. He holds her and takes her inside. Aaliya slaps him and asks how dare you touch me. Nikhil says I have no interest in you. Aaliya says how marriage will happen without Tanu. I am not getting Tanu. Nikhil tells him that bride is here. Aaliya sees Pragya and is shocked. bride get ready. Tai ji asks Tanu? Dasi takes Dadi. Purab, Dadi and Dasi look at Abhi who is sitting in the mandap. Abhi looks at Pragya’s handkerchief. Dasi says she is feeling relieved now. Dadi says even I am feeling peace. 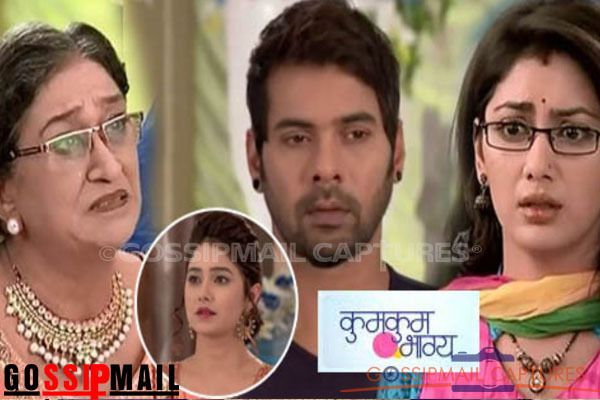 Purab asks Dadi where is Pragya? Dasi says Mitali is here, then where is Pragya? Aaliya searches for Tanu in Dadi’s room and checks under the bed. She thinks Mitali saw her last with Dadi and Dasi and thinks she must be Pragya. She checks in Abhi’s room and thinks to check Tanu’s bathroom. She knocks on the bathroom and asks if you are inside. She sees the door locked and thinks to open it with spare key. She opens the bathroom door and finds her unconscious. Meanwhile goons see Pragya unconscious. Nikhil asks what they are doing and asks them to take her outside. Damru says we shall hide her here itself as she is unconscious. Nikhil says I don’t want her and her reflection here till marriage happens. Damru says we shall throw her out of window. Nikhil slaps him and says security guard is there. They plan to kill her. Damru says we will make her stand and walk with us, everything will think she is a family member. Nikhil gets angry. Damru says shall we take her outside wrapping her with carpet. Nikhil says your idea is good nd asks them to wrap her in the carpet. They wrap her in the carpet. Aaliya asks Tanu to get up, but she is still unconscious. Aaliya thinks how to make her get up and sprinkles water on her face. Aaliya thinks how marriage will happen now. Dasi asks Mitali did you see Pragya? Dadi says no, and asks about Tanu. Mitali says she left her on upstairs. Dadi says how marriage will happen if Tanu don’t come here. Mitali says Aaliya went t bring her. Dadi and Dasi are worried. Mitali asks why you are worried. Dadi and Dasi talk to a guest lady. Nikhil sees the way clear and asks Damru and his goons to bring Pragya out. He asks them not to do any mistake and asks to take her to his place. Damru asks him not to take tension. Nikhil asks him not to take her lightly and meet at the place. Aaliya asks Tanu to get up. Nikhil comes and asks where are you? Aaliya says don’t know. They lift her and take her to bed. Aaliya and Nikhil try to gain consciousness. Nikhil slaps her hard. Tanu is still unconscious. Aaliya scolds him. Tanu gains consciousness and asks how dare you to make him unconscious Purab. Aaliya asks her to get up and says pandit ji is waiting. Sarla and Janki come to Mehra house. Damru collides with Sarla. Sarla apologizes. Janki scolds him. Sarla gets doubtful and asks what is in the carpet. Damru says they are taking extra decoration stuff for other wedding. Sarla asks which marriage happen at this time. Janki asks Sarla to come. Sarla feels something is wrong and prays to God. Damru and his goon makes carpet falls. Pragya hand come out. They put her hand inside. Sarla sees goons taking Pragya inside the truck and shouts Pragya. Abhi is sitting on the mandap.